Back on October 12th I published the post What will this Winter be Like? Two Forecasts for Winter in your Region. I looked at two different long range outlooks from two very different sources: The European Centre of Medium-Range Weather Forecasts (ECMWF) and the from The Old Farmer’s Almanac. One is a cutting-edge computer model based on detailed observations and complicated physics, accounting for climatology and global climate patterns such as El Nino. The other is… The Old Farmer’s Almanac. So who won? Did the ECMWF predict the stubborn blocking high that kept the west warm and the east cold? What about the historic Boston snow? Did the Almanac? Can technology defeat superstition, or are meteorologists still unable to deliver reliable seasonal forecasts? Fingers crossed, let’s go. First, let’s look at the European model’s forecasts again. Now let’s look at The Old Farmers Almanac. I have to admit, I’m a little nervous. 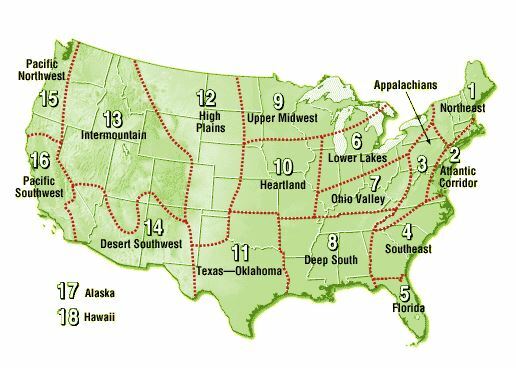 I’m going to assign three points for each of The Farmer’s Almanac’s 17 regions for the continental United States and Alaska. There will be one point assigned for each month. Both temperature and precipitation will be considered. I will be using the Monthly National Overviews published by NOAA’s National Climatic Data Center (NCDC). 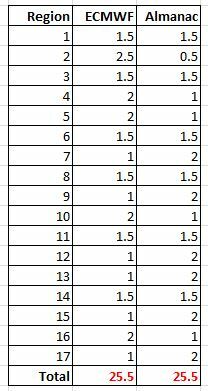 I will be specifically using the Divisional Average Temperature Ranks and Divisional Precipitation Ranks. State ranks will not do because of the Almanac’s crazy climate regions. I must also say that this will not be the most scientific scoring system. It will be slightly subjective and you are welcome to challenge my verdicts. I promise to withhold my bias towards the ECMWF. December was warm everywhere and California saw above-average rainfall (thank you Pineapple Express). January saw the blocking high over the west start to take hold: the west was warm and the northeast was cool. Only the southwest and northern Montana saw extra rain. February was the record breaker, all of the Pacific coastline and the entire states of California and Arizona had record warmth. Now let’s get to the scores! ECMWF: Wet and Stormy throughout the season, especially for southern New England. Most of this precipitation should fall as snow as temperatures are near average for December but colder than normal in January and February. Almanac: A very cold winter. Average temperatures 5 degrees below normal in January. A very wet, and presumably snowy December, but a dry January and February. January: It was a little cold, average precipitation. ECMWF forecast below average temperatures and wet, Almanac had cold and dry. No winner, half point each. ECMWF: Wet weather and mild temperatures make for a rainy December. The rest of the winter is just as wet and stormy but temperatures are below average. Expect above-average snow totals. Almanac: No warm December here. Temperatures are below average throughout the winter, especially in January. December is is very wet, January is fairly dry, and February is close to average. February: ECMWF incorrectly guessed stormy weather but did hit the cold. Almanac forecasted average precipitation and temperatures. Amazing to consider that Boston’s historic snowfall was still near average precipitation for the month. No winner, half point each. ECMWF: Like the Northeast and Atlantic Corridor, this winter is looking wet for the Appalachians. Expect rain to fall in December as temperatures will be mild. In January and February temperatures will be below average and the snow should pile up. Almanac: December and January are very cold. December is slightly wetter than typical (snow perhaps? ); January and February will be on the dry side. February: ECMWF hits on cold but misses the below average precipitation. 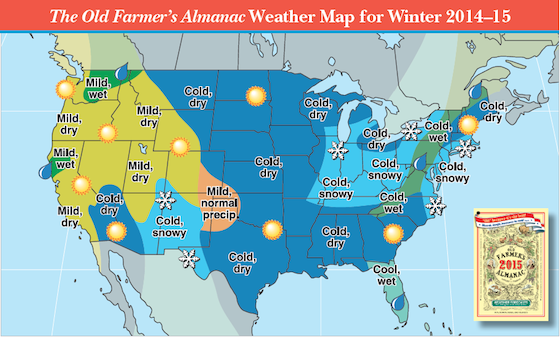 Almanac misses cold but correctly forecasts the dry conditions. No winner, half point each. ECMWF: A warm December and a cold January. January and February will be rainy. Almanac: Cold, cold December and January. No major departures from normal with precipitation. January: Both were wrong. The region was average in both respects. No winner, half point each. February: Neither was very good in February either. No winner, half point each. ECMWF: A warm December throughout the state. January may be a little wetter than average around Tallahassee. Miami expected to have a warm February. Almanac: Very cold in December and January. January should be very rainy. An average February. ECMWF: A wet, possibly snowy December. January is forecasted to be dry. The Euro has February as average to cold temperature-wise. Almanac: Cold and dry in December and January. February is close to average, slightly snowier if anything. December: ECMWF forecast was wet, Almanac was dry and cold. It was warm and dry. No winner, half point each. ECMWF: December is wet with temperatures slightly above average. January and February are cold. Almanac: December and January are very cold. January is very dry. December: Neither forecast was correct. The month was warm and dry. No winner, half point each. February: The month was cold and dry. The ECMWF’s forecast was cold and wet, the Almanac’s was average. I’m calling it a wash. No winner, half point each. ECMWF: December looks warm for Alabama. January looks wet and cold. February just looks wet. Almanac: Colder than average in December and January. Drier than average in January and February. January: The Deep South had a pretty average January. No winner, half point each. ECMWF: December looks wetter and usual. January is uncertain. This means there was very little agreement between model runs. February looks to be near average. Almanac: Slightly colder than average in January and February. Slightly wetter in December and February. December: Both forecasts were the same. December was warm with regions of above and below-average precipitation. No winner, half point each. January: Model forecasts correctly forecasted the dry weather. No winner, half point each. ECMWF: A wetter than average December. A cold January in Nebraska and Missouri. February may be cold as well. Almanac: A slightly drier than average winter. February may be on the warm side. ECMWF: A cold January. Everything else looks average. Almanac: Average as well. February may be slightly on the warm side. December: Neither forecast had the very warm December. No winner, half point each. January: Some of the region was cold like the ECMWF forecast, some of the region was about average. No winner, half point each. February: Both forecasts had Texas and Oklahoma close to climatological averages, which is kind of was. No winner, half point each. ECMWF: A cold December in eastern Montana. January in uncertain and February is seasonably average. Almanac: Average, average, average! Sorry but the Almanac is not predicting any significant departures from normal this winter. December: Both forecasts hinted at slight cold in the region, which did not materialize. No winner, half point each. January: Neither forecast had a warm January. No winner, half point each. ECMWF: December is a cold one in Montana. The southern tier of this region is wetter in December. January is uncertain and February is average. I understand the frustration in seeing “uncertain” here, but its important to distinguish between a 50/50 cold/warm split and good model agreement for average temperatures. Almanac: A warm winter, especially in January and February. January is wet and February is very wet. ECMWF: December is warm and maybe a little wet. El Nino conditions should enhance rainfall across the region. No major departures expected in January or February. Almanac: Above-average rainfall doesn’t arrive until February. January and February are slightly on the warm side. Overall the winter looks pretty average. January: ECMWF was uncertain while the Almanac was correct for warmth and wrong for moisture. I’m calling it a wash. No winner, half point each. ECMWF: A wet December, especially in Oregon. January is warm and dry. February is wet in Oregon and dry in Washington. Almanac: A warm winter for sure. January looks a lot rainier than average. Almanac: A warmer than average winter, although not by too much. January is slightly on the wet side. I will certainly be rooting for the ECMWF to win in this case. December: Tough call. ECMWF was right with moisture, Almanac was right for temperature. I want to give it to ECMWF but I can’t, another tie. No winner, half point each. February: Both forecasts were essentially the same. No winner, half point each. ECMWF: A warm winter is predicted by the ECMWF for Alaska. Northern Alaska is warm in December while Juneau looks cold and dry. The entire state looks very warm and very stormy in January. These are potentially some very dangerous conditions here. February is also warm across the state. December: Really warm and slightly dry. Almanac for the win. It’s the month-by-month scores that jump out to me. You have to remember that the European model’s forecast came out around the beginning of October. The European Long-Range model clearly has a bit of skill for the 60-90 day forecast range, but further out it was less successful. And to be honest, the ECMWF didn’t do that bad. It had extra rainfall across the west in December. This occurred in the form of a couple Pineapple Express incidents. In January the ECMWF had warmth along the west coast. This did materialize when high pressure began to dig in over the western US. The model also had cold temperatures across a big part of the east in February. So how do we explain this disgusting tie? Well first of all, I think it tells us that long-range models are still little more than a coin-flip. Seasonal forecasts, whether done by meteorologists or computer models, fall short just as much as they succeed. It seems like the last several hurricane seasons have performed below forecasts. Obviously people will have problems with how I came to this conclusion. Just remember this is all in fun. I’d still be happy to discuss it in the comment section below. Til Next Time! Learn about PDO! It’s Wikipedia but its still a good article. It’s combined impact with El Nino has shaped a lot of the country’s weather this winter. ← Learn to Read a Skew-T Diagram Like a Meteorologist! In Pictures.